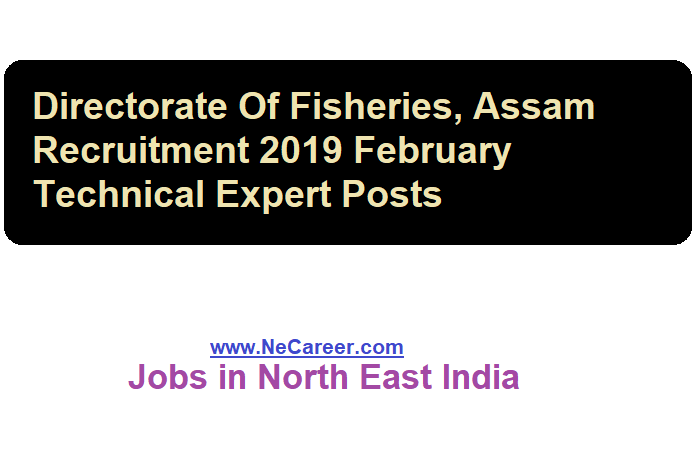 Directorate Of Fisheries, Assam Recruitment 2019 February | Technical Expert Posts :- Hello everyone welcome to North East India's No. 1 Job Portal NeCareer.com . Directorate Of Fisheries, Assam has published a vacancy notification in the month of February 2019. According to the latest Fisheries department Assam recruitment February 2019, applications are invited to hire Individual Consultants under the World Bank financed 'Assam Agribusiness and Rural Transformation Project' (APART) for the Technical expert positions. The details of the job is mentioned below. Educational Qualification: Candidates must be Graduate (min 4 years duration) in Fishery Science from any Govt. recognized University/ Institutions. Experience: The applicant should have minimum 04 year experience in fisheries sector. Age Limit: 45 years as on 1st January 2019. Educational Qualification: Candidates must have Master degree (min two years duration) in Fisheries Science from any Govt. recognized University/ ICAR Institute. Experience: The applicant should have minimum 5 years in Fisheries Sector. Age Limit : 50 years as on 01st January 2019. Interested and eligible Candidates may apply in English language strictly as per the prescribed application format in the website https://fisheriesdirector.assam.gov.in alongwith a cover letter enveloped indicating "Application for the position of______" so as to reach given below within 14 days from the date of published of REOI [09/02/2019].